I am so confused. I have a Chromebook. What do I need to do? Thanks! Mine is lagging really bad today. Yesterday when I downloaded the app, it was the fastest my game has ever run... Maybe they are doing something behind the scenes. I logged out for now. Yeah I agree. Can't even load my inventory for AH and I got stuff want to sell badly. Now it loads in Puffin but not in Chrome or app. dr Laly (1669155) wrote: I don't have options to log out. No,I don't have that section in app. Thats blank. While hot dogs currently work, is there a way to enter them or use them directly from the desktop app? Currently I log into facebook on Chrome and click a hot dog link or copy/paste one into the browser bar and then as it connects, I choose the desktop app. Is there plans in the future to have a way to do this directly from the app or will two browsers be necessary every time? Or the elimination of hot dogs altogether? I don't see it as a browser because if I click on the forum in game it opens up my actual browser. Am I doing something wrong? "What is the Desktop App? The YoWorld Desktop App is a browser, just like Chrome or Safari or Internet Explorer - but it was made specifically to run Flash for YoWorld during the 'in-between' time before 2020." I'm experiencing the same thing with the BVG Browser, is opening my Chrome Browser while gathering Hot dogs or gathering Treasure, Adoption or loot fish in FW, anything from my FB wall or coming to this Forum or FW Community . This morning I opened Chrome, I hadn't logged in anywhere, & I had 2 Chrome Browser windows open: 1 with the Forum, not logged into, besides my other Chrome Browser window with Bible tabs on it. I do log off FB after using your BVG Browser as well as quit the app to close the Browser as I would Chrome from the top left hand side. I'm feeling insecure now, not understanding what/why this is happening. My assumption is Chrome is my default Browser. The BVG Browser is unable to handle tabs, so it defaults to Chrome or opens up several app windows? I had 3 Goldies in my task bar & then it opened Chrome. Than I started shutting windows down when I realized what was happening. Yo is quicker to open Chrome. I'm here since it brought me here. LOL Warm Gentle Group Hug. You all have your work cut out for ya. I'm so sorry, it seems Thankless after reading all the threads, but we don't understand this. Chickadee (103201321) wrote: Re: [UPDATE] Introducing: The YoWorld Desktop App! I would say yes we are safe. I have no worries personally. 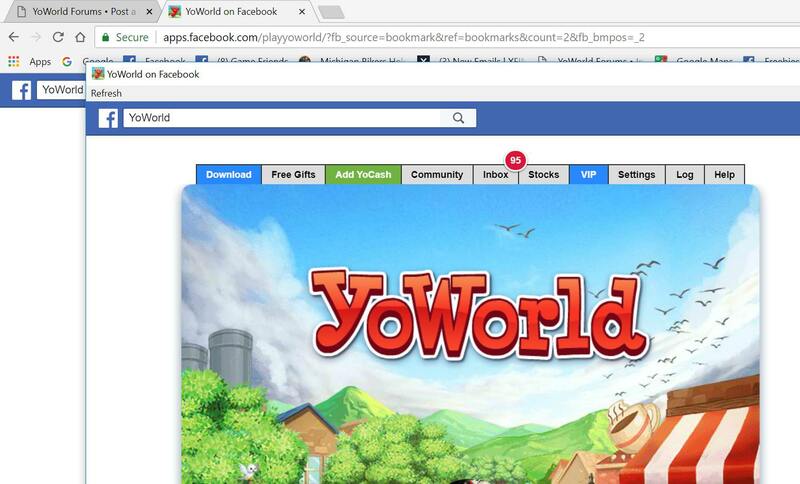 Not sure if this is what you meant by bookmark, but I typed in YoWorld in the search area on your computer, the YoWorld App shows, I right clicked it and pinned to start. Mine is at the bottom of my screen for easy access. If I want to grab hot dogs, I go in through facebook, and then into the app. If you use the pinned one at the bottom of your screen on your computer, it takes you right in game. If you go in through facebook, you would get two screens. At least that is how it is working for me. Facebook in one window, the game app in another. My facebook browser that is open will still have the pop up to choose the app. I close it down or click back to home on facebook. My game is now open as well. it gives me no option to zoom at the top,all that is gone with the new desktop app.it doesn't even have an https address bar,the screen it gives me is too small to play on i had to uninstall the download? Hi, I think this is my first post after playing all these years. My question is on the new download of the Yoworld app. I find the screen tiny and the ads for free coin does not work as good. I logging in through facebook for the free coins, for watching the ads. I have tried using Ctrl and the + to zoom in to get the Yo game to fit my screen. It does not work. Will this be an issue that will be fixed? Thanks, and have a wonderful day. What happen when a player has no computer, so they won’t able to play YoWorld on their iPad or other mobile devices? E lAiNe (183671410) wrote: Hi, I think this is my first post after playing all these years. My question is on the new download of the Yoworld app. I find the screen tiny and the ads for free coin does not work as good. I logging in through facebook for the free coins, for watching the ads. LisaTM (10095126) wrote: Seems to run pretty smoothly - maybe better than it currently does on Chrome. Seems less laggy. I haven't tested out everything on it yet, so I don't know. The one thing I don't like, though, is that I can't expand the game screen. I have mine set to 110% on Chrome, but there's no way to adjust the size/resolution on the app. Not the end of the world, but it would be nice if there could be an option to adjust the settings, IF possible. Thank you, Yes, I have Yo & FW pinned to my task bar, as you do. To gather Hot Dogs, I go to FB Home Page, Saved Links, Hot Dog & Chrome Browser will open. Forum link inside Game opens Chrome Browser instead of a another Tab, or just going there like it did from BVG Yo to FB Home. I understood I don't need Chrome open for this BVG Game Browser is sufficient to run Yo or the other BVG Browser to run FW. But not all links are remaining inside the the Browser, it reaches out to open Chrome. What else can/could open up accidentally or because of a needed link up? Yo, Yo Forum, FW & FW Community, Hot Dogs, Treasure fish, Adoption fish or Loot fish should be accessed on 1 BVG Browser. A Browser should take you to the link , by tab or changing pages, not another Browser that is closed. This is complicated for sure. They do excellent programming, they will get this all sorted & together shortly. Bookmarks is a want not a need to have now LOL like we have on Chrome Browser, different address for daily access or interest. Actually the 2 app icons are acting more like tabs or bookmarks not a full Browser Maybe BVG Browser is like a plug in, but what do I really know about programming? We are spoiled by having saved links that are safe & always been the same right address. Have a patient day. You finally did it. I'm official done with YoWorld. I went though all the changes with you and been playing since 2009 but this is it. I'm done. It won't let you has to be windows 7 or higher. JenE Craig (111121099) wrote: You finally did it. I'm official done with YoWorld. I went though all the changes with you and been playing since 2009 but this is it. I'm done. You do realize you don't need this app at all correct? 2020 is a long way away. They made this app and are continuing to do so, so that we can continue to play past 2020. They didn't have to do anything and could have closed up shop. Last edited by BykaChic (134177197) on Wed Jul 11, 2018 5:25 pm, edited 1 time in total. Been playing this game since you came out with it. I am now a VIP member and am about ready to quit that as well as this game. I am unable to load this on facebook and I have installed the desktop app and even that is not loading. My home is there, as are my friends but most do not have clothing on, when I click on them or anyplace the only thing that happens in the yellow bar above my avatar's head just keeps saying "loading" but it never loads. I have to re-fresh on both sites. I try to play the gem game and I can not load the page I need to visit. I have not been able to load the calendar and have fallen behind so now of course it wants me to pay to catch up. I have put money into this game over the years and do not appreciate the fact that I can not get it to load properly.